Join us on April 12th, at the Historic Kenton Firehouse, for a presentation by Pam Wasson, Executive Director of the Lord & Schryver Conservancy. Ms. Wasson will discuss the work and legacy of Elizabeth Lord and Edith Schryver, the first women in the Pacific Northwest to own and operate their own landscape architecture firm. For more details, see our events page. Our new member program makes it easy for everyone to support the Rose Garden. Your tax-deductible member dues provide us with the funds to keep our volunteer program strong and our mission to preserve the Garden on track. For more information, read our Membership Program details. Want to Volunteer at the Rose Garden? We’re just about to start our deadheading season in the garden, and we would LOVE your help! We will have a New Volunteer Orientation on June 6th, from 9:00 am to 9:30 am, but if you want to start sooner, we’ll be in the garden s tarting on June 1st, every Monday, Wednesday, and Friday from 9:00 am until 12:00 noon. Any of our current volunteers will be happy to get you started with a quick orientation and demonstration on deadheading. If you can’t make the June 6th orientation, just show up any other Monday, Wednesday, or Friday and somebody will help you get started! Super easy, very relaxed. And on Friday, snacks! Emanuel Mische designed and oversaw the construction and opening of the Peninsula Park Rose Garden in 1913. A traditional French design for a strolling garden with a fountain in the center, Mische based his design on original sketches by the Olmstead Brothers firm, where he was employed while designing the garden and other parks in Portland. Mische later went on to become Portland’s first Parks director. Peninsula Park Rose Garden celebrated its Centennial in 2013. Peninsula Park Rose Garden, Portland, Oregon’s oldest public rose garden, opened in 1913 and was designed by Emanuel Mische. 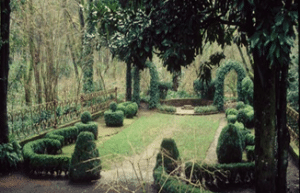 The rose garden is a traditional French design, based on initial plans by the Olmstead Brothers firm, where Mische had worked before taking the job as Portland’s first Parks director. Donations to Friends of Peninsula Park Rose Garden are tax-deductible, and are used to help us preserve and enhance the historic Peninsula Park Rose Garden and its 105 year old masonry. Click the button to make a donation via PayPal. You do not have to have a PayPal account to donate. Thank you! Garden volunteers are welcome anytime. During the bloom season (May – Sept) we are in the garden 3 days a week from 9 a.m. until noon. On Fridays, during the season, you’ll find snacks and often, our horticulturist will provide a brief lesson on some aspect of rose gardening, pest management, or disease control. We also have an active Board which is frequently looking to expand its membership. If you are already a volunteer and want to update your required PP&R forms, go to our Forms page to download. If you want to track your volunteer hours, use our Track It Forward app. Join our mailing list to receive the latest news and updates from the Peninsula Park Rose Garden. We never share your email address, ever!